Linyanti Bush Camp offers the perfect setting for an authentic and wild safari experience. As the only source of water in the dry months, the Linyanti marshes are one of the most sought after destinations in Northern Botswana, boasting a great diversity of game and a peaceful atmosphere. The area offers spectacular birding all year round and is best known for its large herds of elephants that move down to the Linyanti River at the start of the winter months and only move back inland once the main rains arrive. Lion, sable, roan, leopard, and wild dog are also frequent visitors to Linyanti Bush Camp as is the elusive sitatunga antelope, red lechwe, hippo and crocodile. 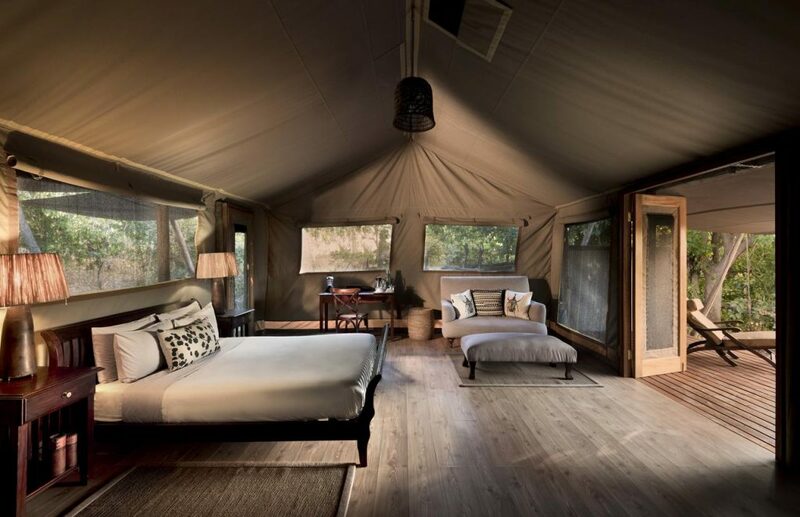 Bordering the western boundary of Chobe in the Chobe Enclave, Linyanti Bush Camp is an intimate tented camp comprised of six luxury tents with en-suite bathrooms for a total of 12 beds on the banks of the Linyanti marshes in a private reserve. Activities from the camp include game drives, walking safaris, game viewing from hides, spot-lighting, bird watching as well as guided mokoro safaris, when water levels permit.